The maximum loan amount for first time borrowers is up to $ 500 and for loyal clients can go as high as $1500.00 (depending on our Kener Score and your Kener Status). For first time borrowers, your loan will be due on your next salary date that falls between 8 to 35 days away (if your next salary is within 6 days your loan will be due on the next payday which falls 20 days away). If your salary date fall outside of these ranges, your loan will be due within 14 days. Our loyal members, with a Kener Status of Gold are entitled for a 3 months loan, Platinum and Diamond Members are entitled for a 6 months loan. You have the right to repay your loan in full on your due date. However, you also have the option of requesting to extend your loan due date up to a maximum of 4 times. If you extend your loan due date, you will pay your Credit Access Fee and lender interest on the original due date and pay your loan principal, any additional interest and Credit Access Fee on your extended due date. After you have extended your loan due date four times, you may be eligible for an extended payment plan. For more information on the extended payment plan click here. Extension, partial payment, and early payoff requests must be received untill 3 P.M. CST at least 1 business days prior to your due date. You may request these changes by sending an email to service@kenerlending.com or calling our customer service team and you will have to sign your new loan documents. For more information on extensions visit our FAQ page. Your Credit Access Business fee will be $25.00 per $100.00 borrowed (If your Kener Status is Silver or more you will be getting a discount on these fee, see Kener Status page for more information). In addition to the fee, you will also be charged interest by your lender of 10.00% APR on loan principal (which will be determined by your loan term). Click here to find fee schedules for four common loan amounts offered to our customers. 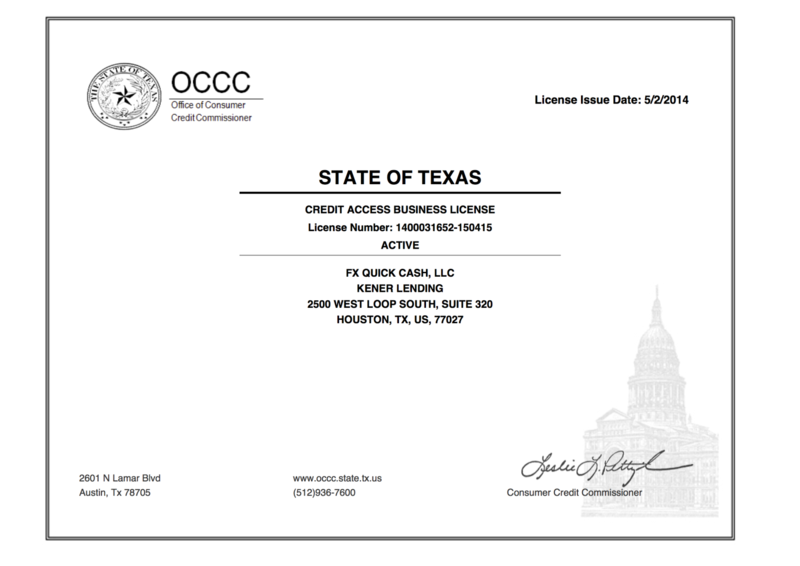 These four links lead to disclosures, required by the state of Texas for all residents applying for a CAB loan or an extension, which outline the total costs associated with a two-weeks loans of different amounts. An advance of money obtained through an installment loan or auto title loan is not intended to meet long-term financial needs. An installment loan or auto title loan should only be used to meet immediate short-term cash needs. Refinancing the loan rather than paying the debt in full when due will require the payment of additional charges.